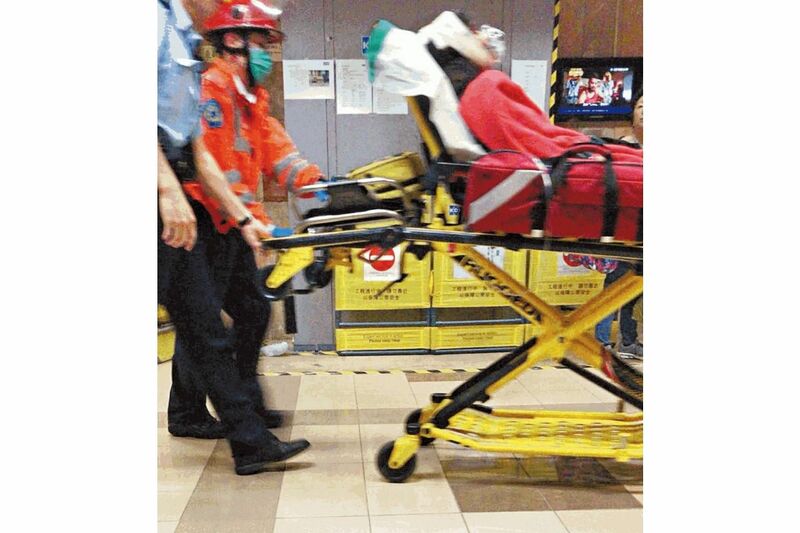 HONG KONG - A husband and wife, both 32, are fighting for their lives after a lift they were in ascended and crashed into the top of its 46-storey building on Sunday (April 8), Hong Kong media reported. The incident has prompted Hong Kong authorities to call for urgent inspection of 300 lifts in the city. The couple were taking the lift to their 15th floor apartment at Block 2 of Waterside Plaza at about 4pm. The lift surged upwards and smashed into the top of the lift shaft, seriously injuring both of them, the Electrical and Mechanical Services Department said. The compartment's ceiling was crushed downwards in the estate in Wing Shun Street, Tsuen Wan, South China Morning Post reported. The couple were believed to have been flung against the lift's wall despite holding on to the lift railings, and then injured by broken materials, including glass, from the lift's ceiling, Apple Daily reported. The husband is said to have suffered head injuries, and the wife was injured in her neck. Firefighters rescued the couple, who were seen conscious, from the compartment. They were sent to Princess Margaret Hospital and their condition was stated as critical on Sunday, the Post said. On Monday (April 9), their condition was reported to have improved from critical to serious. It was a very rare incident, a spokesman for the Electrical and Mechanical Services Department (EMSD) said initially, adding that the suspension cables were still intact after the incident. An initial investigation has revealed that insufficient traction between a pulley and suspension cable was the likely cause of the incident, the EMSD said on Monday. “The incident may have been caused by insufficient traction between a suspension cable and sheave (pulley), or it may be the malfunction of its braking system. The situation is rare,” it said. The EMSD has ordered registered contractors to carry out a citywide inspection, within two weeks, on 300 lifts of the same model, made by the same manufacturer, the Post reported. A check of the closed-circuit television video showed another passenger had taken the lift with the couple, but got out on the seventh floor, after which the lift ascended uncontrollably. The lift's emergency braking system was not activated as the lift was travelling either at a normal speed, or marginally faster, at the time of the incident, according to the Post. This is the second such incident in the estate in four years. Another lift at Block 1 smashed into the top of the building while it was under repair in January 2014. No one was injured in that incident.